Colonel Bihi’s $80.000.000 Corruption In One Year ! A great President’s work can be summed up in one sentence. And, that when a person hears that sentence, they don’t even have to hear the name of the President to know who is being talked about. • Abolished apartheid in South Africa. • The chairman of SNM who led liberating Somaliland from the dictatorial regime of President Sayid Barre & first president of Somaliland . 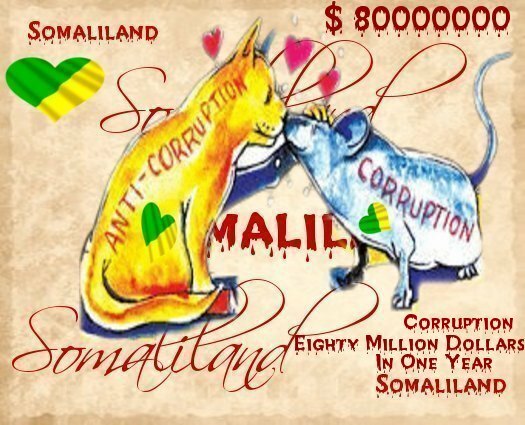 • Sa’ad Muse Clan First ( Not Somaliland First ) , $ 80.000.000 Corruption in one year & Tukaraq War ! You probably don’t have to be told that the above sentences are describing the work of President Abraham Lincoln , President Franklin Delano Roosevelt, President Nelson Mandela , President Abdirahman Ahmed Ali , President Mohamed Haji Ibrahim Egal , President Dahir Riyale Kaahin, President Ahmed Mohamed Mohamoud Silaanyo and Maybe if there is no change Colonel Muse Bihi Abdi respectively. So alongside his great weakness we think Bihi’s greatest failing is his loyalty to his sub-clan/ comrades even when the evidence of massive corruption is obvious. Colonel Bihi simply isn’t up to the task of dealing with it – even within his own Sub-Clan . Perhaps true greatness, or a truly great President, is someone who does the right things for the right reasons without expecting grand external rewards. They don’t do things “to be the best” or “to be famous” or “to be a legend”. Instead they sacrifice those ambitions in favor of simply doing what the people around them most need.